Situated on Jihuluntu Mountain 54 kilometers north of Baotou city, the Wudangzhao Temple is a state-level key relics protection unit and a 4A-level scenic spot. 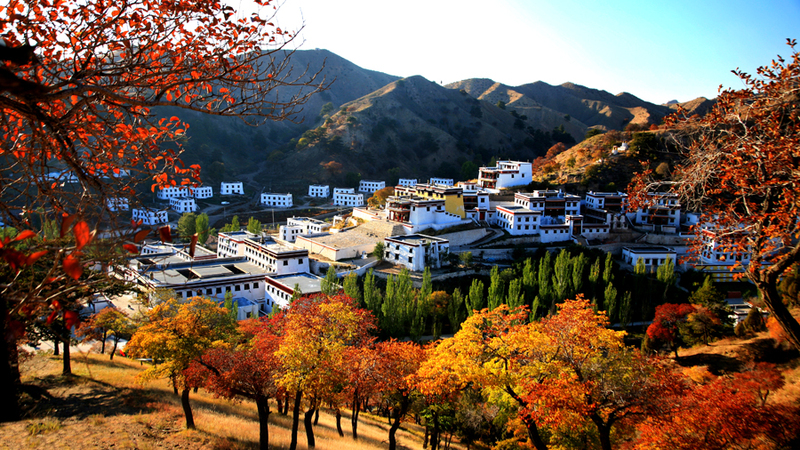 It is named "Wudangzhao" because it was built in the Wudang Gully of the Daqing Mountain. The Wudangzhao Temple is one of the three major temples of Tibetan Buddhism together with the Potala Palace in Tibet and Ta'er Monastery. Built during the reign of Kangxi in the Qing Dynasty (1644-1911), Wudangzhao Temple is the biggest Tibetan Buddhist temple in Inner Mongolia. With an area of more than 300 mu, it has 2,530 storehouses. In its prime, there were more than 1,200 lamas at the temple. The temple is composed of six halls for chanting Buddhist scriptures, three Living Buddha mansions, one mausoleum and multiple lama dormitories. All of the buildings have a Tibetan-style, flat-topped, square structure. Suguqin Hall: Built in 1757, it is the biggest building in Wudangzhao, located in the forefront of the temple. The front hall is for chanting Buddhist scriptures. The Sakyamuni statue and 31 Bodhisattva statues are in the center. There are frescos depicting Sakyamuni's life story on both sides of the hall. Suguqin Hall is the gathering place of the temple. Dongkuo'er Hall: Built in 1749, Dongkuo'er is a central building of Wudangzhao, as this was the place for the teaching of astronomy, geography, divinity, the calendar and mathematics. It was also named the "Auspicious and Mathematics School." Every March 15, an academic exam was held here. Both the examinees and examiner stood on the spacious platform in front of the hall. The examiner asked questions and the examinees answered and argued with each other. Queyilin Hall: Built in 1835, it was second in scale only to Suguqin Hall. This was a place for special instruction in doctrine, and was therefore known as the "Religion Department" or "Philosophy School." The highest Sakyamuni Buddha bronze statue in Wudangzhao is in the hall. With a height of 10 meters, it is the biggest bronze Buddha statue in Inner Mongolia. Ahui Hall: Built in 1800, this was the place for medical education. Therefore, it was called the "Medical Department" or "Medical School." Two wings --- "Esoteric Recipes" and "Medicine" --- were set up. The 18 arhat and the four deva-kings of the four quarters statue, steep and vivid clay sculpture cave, apothecary Buddha, Amitabha and White Tara are worshipped in the hall. Rimulun Hall: Built in 1892, it was a Doctrine Department and the place to study the history of Lamaism and its doctrine and canons. A bronze statue of Tsongkhapa with a height of 9 meters is worshipped in the center of the hall and the statue is the biggest one of Tsongkhapa in Inner Mongolia. One-thousand small statues of Tsongkhapa are worshipped in the two areas upstairs and downstairs.